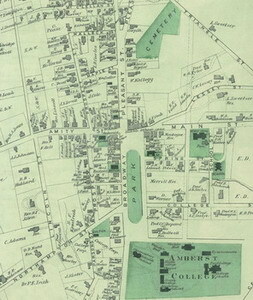 In March, 2007, Ed Wilfert found two separate printings of the 1873 edition of Beers Atlas of Hampshire County in which Plates 42 and 43 depicting downtown Amherst were different. This was surprising because land surveyors and others who have compared the Atlas to property records taken from deeds and other maps concluded that the Atlas was fairly accurate. The plates have some differences in pictorial content, but the most notable difference is the scale notation. The plates from the earlier printing have a scale notation of one inch on the map to 18 rods of horizontal measurement on the ground, which is an error of 30%. It is possible that Edward Dickinson in his review of the new atlas began to interpret lot distances of his land holdings using the noted scale and discovered the error. He likely complained to the Beers Company and threatened legal action if the plates were not corrected. Beers probably returned to Amherst in late 1873 or early 1874 to check the measurements and data. They then issued a small second printing of the Atlas in 1874 which included the newly revised plates. The revised plate has a scale notation of one inch to 25 rods (this scale being within a 3% error) and also shows about twenty or more changes in owner names and property lines. Some errors remained, such as “Boltwell” for “Boltwood”. The Jones Library Special Collections edition has a hard cover date of “1871”. Did they mean to print 1874?